Four Groundwork Trusts from Denver, Cincinnati, Hudson Valley, and Elizabeth, NJ, were among 59 grantees recently awarded Five Star and Urban Waters Restoration Program grants from the National Fish and Wildlife Foundation (NFWF) and the U.S. Environmental Protection Agency (EPA). This year, a total of 59 projects in 30 states and the District of Columbia were awarded a total of $2.2 million. Grantees committed an additional $5.2 million in matching contributions, for a total conservation impact of $7.4 million. The annual grant program supports diverse local partnerships to restore wetland, forest, riparian, and coastal habitat and promote stormwater management, outreach, and stewardship with a focus on water quality, watersheds, and the habitats they support. The 2018 grant winners were selected from a highly competitive pool of more than 250 applicants. The awarded projects involve a high level of partnership between community groups, local government agencies, elected officials, businesses, schools, and environmental organizations. A full list of 2018 projects is available here. In New York, Groundwork Hudson Valley will use the grant funds to restore 2.5-acres of a six-acre wetland located along the Saw Mill River at the northern end of Yonkers, just as the watershed is entering its most developed and densely populated areas. The wetland is critical to providing habitat to a wide range of fish and wildlife and other aquatic species. Restoration of this wetland will also protect upland areas, including valuable residential and commercial property, from flooding. Groundwork Hudson Valley will perform this work with the help of its Green Corps youth program from Yonkers, volunteers, the U.S. Fish and Wildlife Service, and partners associated with the Saw Mill River Coalition. “Groundwork Hudson Valley is thrilled to move forward implementing the EPA/NFWF Five Star grant to improve stormwater management, reduce flooding, and improve water quality while fostering greater stewardship of natural resources in our community through youth-led projects on the Saw Mill River, an extremely important tributary of the mighty Hudson River,” said Groundwork Hudson Valley Executive Director Brigitte Griswold. In Colorado, Groundwork Denver will use its Five Star and Urban Waters grant to carry out water quality outreach and residential activities to improve the water quality and riparian habitat of Bear Creek in Denver County. The project will also provide a career pathway for 34 low-income youth employees and stewardship opportunities for local residents by offering education and resources to reduce human impacts on the watershed. 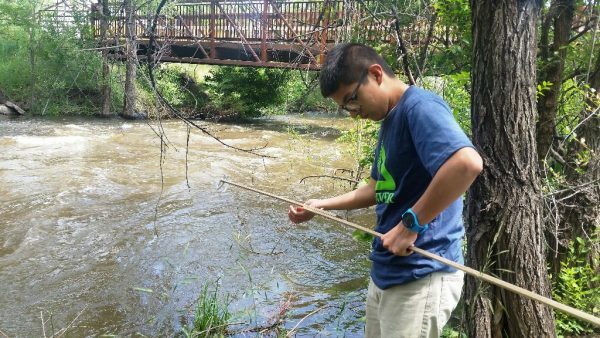 Groundwork Denver will install green infrastructure to reduce runoff from residential properties, coordinate community volunteer days to remove invasive plant species, clean up trash, and replant native species in the riparian habitat. Project partners include Home Depot, River Network, Colorado State University Stormwater Center, Eco Friend Bee, Harvey Park Sustainability Team, Metro State University, Colorado River Watch and the cities of Denver, Lakewood, and Sheridan. Groundwork Cincinnati/Mill Creek Alliance will restore 28 acres of wetland, riparian, and prairie habitat to benefit wildlife (including the state threatened Black-crowned night heron), people in Cincinnati’s Mill Creek watershed, and the Muscatatuck National Wildlife Refuge. The project will engage 921 participants, including 800 middle and high school students, 40 teachers, 21 youth employees, and 60 adult volunteers from local neighborhoods and diverse partner organizations, including include Easterseals, The Nature Conservancy, Muscatatuck National Wildlife Refuge, Cincinnati-area schools, and the city of Cincinnati. In New Jersey, Groundwork Elizabeth will coordinate the Great Swamp Community Partnership, engaging 12 youth from the Groundwork Elizabeth Green Team and 350 youth from community programs, such as the City Summer program, YMCA, Boys and Girls Club, and Kean University, to restore 1.5 acres of the Great Swamp Refuge. The project will share skills with staff and the Friends of the Great Swamp, create a new generation of environmental leaders, and engage a host of Great Swamp National Wildlife Refuge staff and volunteers at two project sites. Project partners include Kean University, Union County parks and Recreation, the City of Elizabeth, Great Swamp National Wildlife Refuge, Environmental Endowment for New Jersey, Phillips 66 Bayway Refinery, and Friends of the Great Swamp.